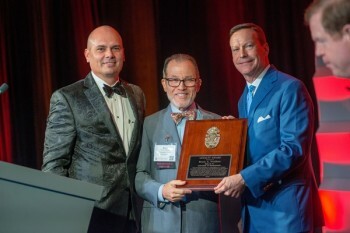 Bruce Wolfson, 1974 graduate from the University of Pennsylvania, received The Loyalty Award at Pi Kappa Alpha’s (PiKA) Sesquicentennial International Convention. The award, one of the highest honors bestowed by the fraternity, came after decades of service. Wolfson, Beta Pi '71 was looking for a fraternity to join when he walked through the doors of Beta Pi, Penn’s PiKA Chapter. He was not, however, expecting to end up there. With family members hailing from different fraternities where he had started building connections, he was unlikely to pledge where he had no relationships. Little did he know, that’s exactly what he’d leave with after that initial visit. With that vision in mind, Wolfson was all in. He was heavily involved from the start, serving as a kitchen steward sophomore year, which Wolfson recalls as becoming something of an “indentured servant,” and was heavily involved in rushing. He played a role in getting about 22 members to join the fraternity – a group that heavily influenced the success at Beta Pi. It was an enormous number of recruits at that time, and it changed the game. “The range of things we could do just grew and we did more and more, and from that point on there was an upward trajectory. By the time I was President my junior year, we won our first of four consecutive Smythe Awards,” Wolfson says. His involvement continued into his time in law school at Penn when he was a Chapter Advisor to Beta Pi and as Assistant Director in the Office of Fraternity and Sorority Affairs. When he went to Chicago after law school, he served as Chapter Advisor at Northwestern University and then to Columbia when he moved to NYC in 1986, after four years living in Mexico. After a number of years of service, he was invited to become a trustee of the PiKA Foundation, which was established to raise funds to empower the educational mission of the fraternity. Wolfson still maintains regular contact with the group of men he spent his time with at Penn, and one of them gave him the greatest gift Wolfson credits to his time at the fraternity. The friendships are undoubtedly a treasured gift, but what Wolfson credits their depth and longevity to goes beyond just shared memories. The group at Beta Pi created a culture centered on a shared mission to do something special – something that mattered to them, to the other brothers, to the community. It was centered on building character and leadership. Even before that became a central mission for the fraternity leadership, it was at the heart of what they did at Penn. “Friendship is an incredible blessing, but a friendship that is centered around a shared mission, shared goals, and shared values, those are the friendships that last 40-50 years,” Wolfson says. That shared mission has become a reality for the fraternity over the decades since Wolfson’s graduation. 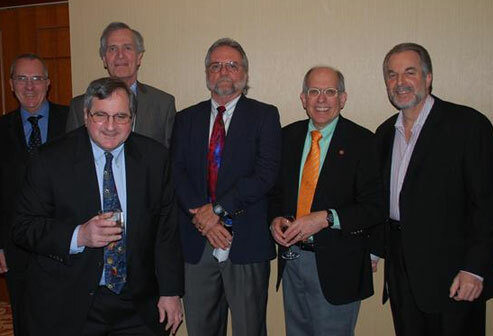 Wolfson co-chaired the Return to Values Task Force that worked to create a new vision, a mission statement, and a creed for the fraternity that was approved in 2002. PIKE University also launched in 2002, which was designed to bring that mission to the membership. It wasn’t about just creating the mission and vision, it was, and still is, about ensuring the members embraced the values that the fraternity stands for. It’s about empowering them to become leaders, and not just talk about the values but live them, promote them, and deliver them to the communities they live in. Since the launch of PIKE University the fraternity has started to evaluate chapters by their adherence to those values. They also launched regional leadership training targeted at all members and various levels of leadership in order to provide members with the tools to accomplish the shared mission. Despite Wolfson’s undeniable role in contributing to these major successes, The Loyalty Award was not something he saw coming - even well into the nomination speech. And even after all of his service on the board, and his intentions to continue service, the reason Wolfson stays involved has less to do with the board service, and more to do with his life passion - mentorship. His unique role has given him the opportunity to impact the lives of hundreds of young people, and that is the true value Wolfson sees in his service. For Wolfson, that’s what his service is all about.